5 Bollywood Sarees You Should Not Miss This Season! Saree is an epitome of India’s culture and tradition. When a woman drapes it around her body, it goes on adding glitters to her personality. Come festival; function or occasion and we women seek an opportunity to drape it elegantly. Not only married women, but unmarried women and girls love to add it in their wardrobe. When we saw Priyanka Chopra grooving on ‘Desi Girl’ song in a saree, our love for saree grew several notches higher! In fact, this saree of her made women go crazy over Bollywood sarees. There have been several instances in which Bollywood divas donned saree from reel to real life and gave us some serious fashion goals. Here, we are going to suggest you some cool sarees to take inspiration from for your next Bollywood saree online purchase. Let’s take a look. This pastel saree worn by Karishma Kapoor is definitely depicts a girl’s saree love perfectly. The sequin work running all over it in a zig-zag or unusual form is seldom seen in any saree. While this pattern makes it unique, the shimmering glow gives it a party wear look. Flaunt it like Kareena Kapoor and acclaim everyone’s appreciation. Go for floral sarees online and add some floral effects to your personality. This pattern has long been considered evergreen and comes handy in every season. Wear it across all your special events and leave behind a lasting impression. Even you can wear it for your college functions to let your friends admire your desi girl looks. Choose a necklace for accessorizing with statement earrings. Make a chic bun for added sophistication. Wear high heels and walk like a queen in a floral nine-yard-drape! In India, silk saree is one of the famous sarees. Women just go crazy over the silky touch of it. If you have been planning to join a wedding function, choose a silk saree to make a remarkable appearance. Choose bold colours like maroon, golden, bright pink, orange or yellow. Take inspiration from Anushka Sharma, who looks stunningly beautiful in this Bollywood silk saree. A chic cun, jhumkis and a big smile are what you need to rock this look. Wear statement bracelets to finish off your look. When it comes to online sarees especially of Bollywood, we just can’t ignore the quintessential avatar of Rekha in a Kanjeevaram saree. Her every appearance takes us towards the magnificent beauty of kanchipuram drapes that are famous all over for their shimmering gloss and outstanding work. 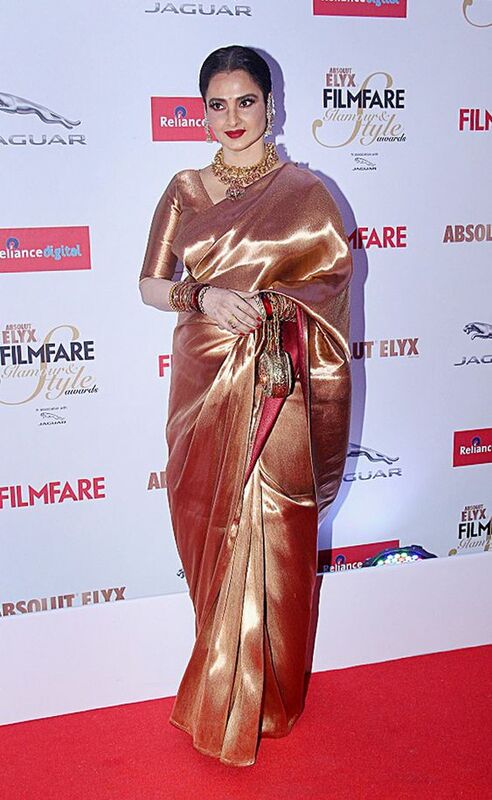 For a wedding appearance or family function, wear kanjeevaram saree as veteran actress Rekha does. Let your hair fall freely over your shoulders to add glamour to your overall appearance. The charm of half and half Bollywood saree is undoubtedly the loudest. Women of all ages love to drape a half and half saree as it gives both the look of a saree and lehenga. You can flaunt it across various occasions and claim one’s appreciation for sure. So, take ideas from these sarees and be prepared to make a desi avatar this season.